Minarik Drives' C4XL3200A filtered pulse-width-modulated (PWM) variable speed DC drive provides exceptional performance. It is housed within a NEMA 4X enclosure, guaranteeing protection from washdown, corrosive moaterial, windblrown dust, incidental contact with enclosed equipment or unwatned external solid ojects. It outputs nearly pure DC power to brush-type motors ranging from 1/2 to 2 HP. The C4XL3200A accepts 115 or 230AC input to output 0-130 or 240VDC, respectively; resulting in higher speeds from standard 90 or 180VDC SCR duty motors. This innovative technology lets users operate many low voltage motors with only minor calibration adjustments. MOSFET power devices switch at 22kHz, which is above the audible range, to provide fast circuit response and a constant 1.05 form factor over the entire 100:1 speed range. The highly efficient C4XL3200A drive provides cool, quiet motor operation with extended brush life and low maintenance. In addition, it can operate smaller size, lower voltage motors to provide both cost and space savings. 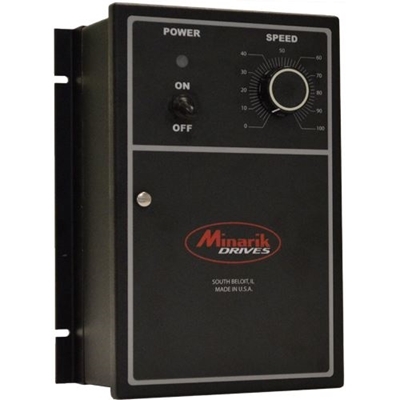 Minarik's C4XL3025 filtered pulse-width-modulated (PWM) variable speed DC drive provides exceptional performance. It is housed within a NEMA 4X enclosure, guaranteeing protection from washdown, corrosive material, windblrown dust, incidental contact with enclosed equipment or unwanted external solid ojects. It outputs nearly pure DC power to brush-type motors ranging from 1/20 to 2 HP. The C4XL3025 accepts 115 or 230AC input to output 0-130 or 240VDC, respectively; resulting in higher speeds from standard 90 or 180VDC SCR duty motors. This innovative technology lets users operate many low voltage motors with only minor calibration adjustments. MOSFET power devices switch at 22kHz, which is above the audible range, to provide fast circuit response and a constant 1.05 form factor over the entire 100:1 speed range. The highly efficient C4XL3025 drives provide cool, quiet motor operation with extended brush life and low maintenance. In addition, it can operate smaller size, lower voltage motors to provide both cost and space savings.